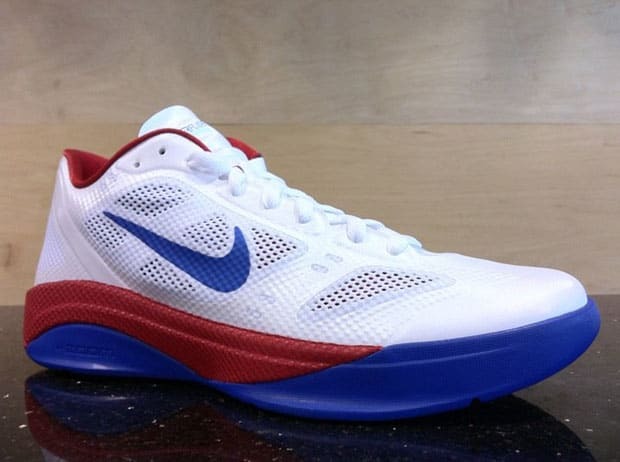 Nike Zoom Hyperfuse 2011 Low "USA"
This pair of Hyperfuse Lows will go great with Team USA at the London Games in 2012. Maybe Rajon Rondo will make the squad this time? The Hyperfuse and mesh upper allows for a lightweight experience and ultra breathability. The low-cut style gives the players who are used to the Kobe VI cut another alternative. They&apos;re available now at Nike accounts including Miami&apos;s SoleFly.